Frogfish (Antennariidae) is a particular hunt for experienced divers – it’s a bit like searching a gold nugget in the sand or a Pokemon to be more modern. The Frogfish we found in our house reef at Twofish Amed are tiny ones. If some of them (Giant frogfish) can reach a maximum size of around 40cm, we are more likely to find individuals to a maximum size of 10cm and usually way smaller. This week as well, with Open Water student Amin from Germany, we had a magical encounter with a lot of action in our house reef. We have a group of cake urchins with bright pink and purple colors that we are used to but this week we found 13 ornate ghost pipefishes chilling over and a bunch of baby octopuses plus couples of juvenile moorish idols. We stayed there for a while just looking at the scene and for his only second dive in the ocean, Amin can say he is lucky.  Come for a frogfish hunt with Twofish Amed. In the worst case, you’ll see so many things that you will eventually forget about it if you have not seen any.